I don’t think I’ve shared with you how miserable my cake pops turned out for my daughter’s birthday! They weren’t horrible, and they were for sure eaten….they just weren’t the prettiest cake pops you’ve ever seen. However, my Indoor S’mores Pops turned out WAY better! We love to make fires in our fire pit, but when the temperatures are 100+ degrees, that’s not happening! I decided to make some indoor s’mores to feed the craving of my kiddos, and they were a hit! 1. Create a double boiler on your stove with a pan of water covered by a slightly larger bowl. Bring the water to a boil, and add the chocolates to the bowl so they begin melting. Reduce the heat to medium. 2. While the chocolate is melting, finely crush the graham crackers and put sticks in the end of the marshmallows. 3. When the chocolate is melted and smooth, dip the marshmallows in so they are covered in chocolate. Let the extra drip off, then gently roll them in the crushed graham crackers. 4. Set them on a piece of wax paper to harden. Enjoy! They were super simple, and gave us some indoor fun! 1. 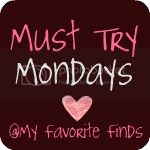 Include a Must Try Monday button OR a text link back to My Favorite Finds. Yum! I love the idea of indoor s'mores. Can't wait to give these a try – they sound so easy and look great! These s'mores pops are awesome! I love these s'mores pops. They're a lot of fun. We've used the ginormous marshmallows, but I think I like them better with just the large marshmallows. Hi Carrie! I love those s'mores pops. What a fun idea! These look great – definitely going to have to try them!